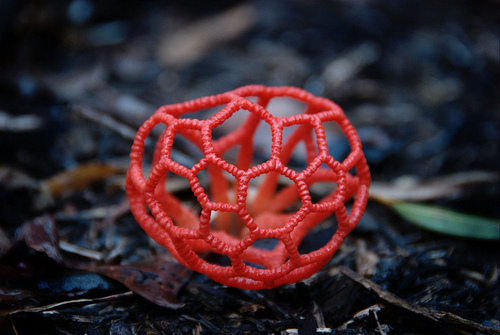 Conspicuous sacred geometry displayed by the "Basket" Fungus (Family: Phallaceae), native to New Zealand, reveals the Fungi Kingdom's shared connection to our supremely intelligent Universe, and our common fundamental level language encoding. 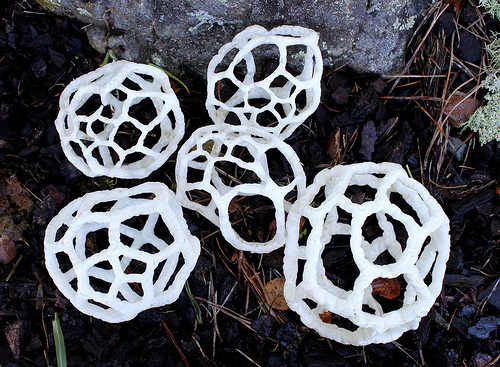 Why do you suppose this organism grows into a hollow pentagonal-hexagonal lattice sphere-shape (C-28 Fullerine shape)? Considering that Nature itself faithfully manifests the authorship of the supreme universal intelligence, then couldn't we assume that this Basket Fungus organism is deliberately sending out some kind of message to all eyes whose creatures are genetically encoded to notice its geometric pattern, shape or color message against the background of the forest floor?